Viterbo acquired great importance in the XIIIth century when the popes lived in the Papal Palace (see page one), but after that period it slid into obscurity; in 1460 work started at the old Town Hall to turn it into the residence of the papal legate, the governor of the town; only the portico belongs to the medieval building while the windows are similar to those of Palazzo Venezia in Rome, which also was being built in that period. 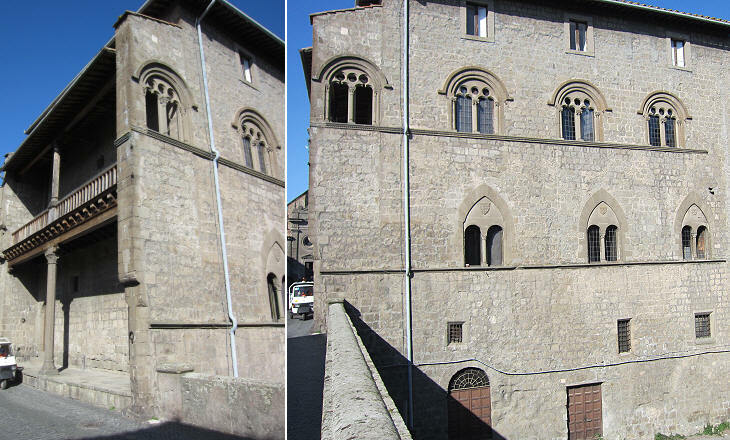 The rear side of Palazzo Comunale ends with a terrace which offers a fine view over the hill situated at the north-western corner of the town; in 1626 the terrace was embellished with a fountain, similar in shape and design to Roman fountains of that period. 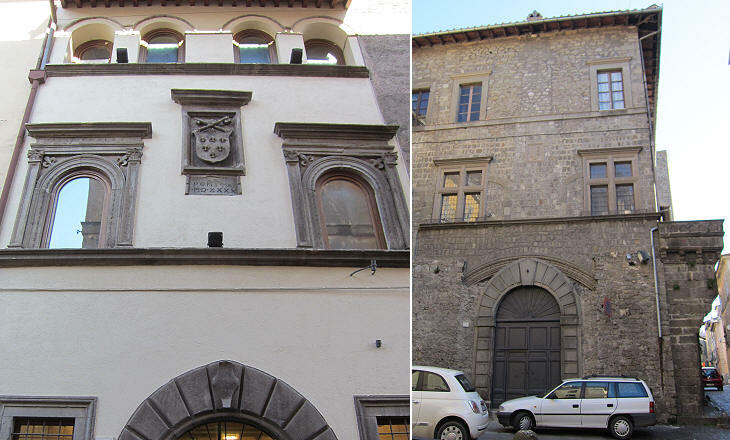 The palace still houses the Town Hall of Viterbo. The ancient sarcophagus which is decorated with a boar hunting scene is named after Bella Galliana, a legendary beautiful woman, for whom a Roman baron waged war on Viterbo; his attempts to conquer her by force having failed, he offered to lift the siege to the town in return for being given the chance to see her again; when the beautiful woman appeared at the window of a very high tower (see page two) he killed her by shooting an arrow. S. Maria della Verità is a medieval church outside the walls of Viterbo, which because of its proximity to the railway station was heavily bombed in 1944; an excellent restoration has recovered to a great extent the fine frescoes which decorated a Renaissance chapel; the paintings by Lorenzo da Viterbo (1472) are very interesting also because they document the way the richest inhabitants of Viterbo were dressed. 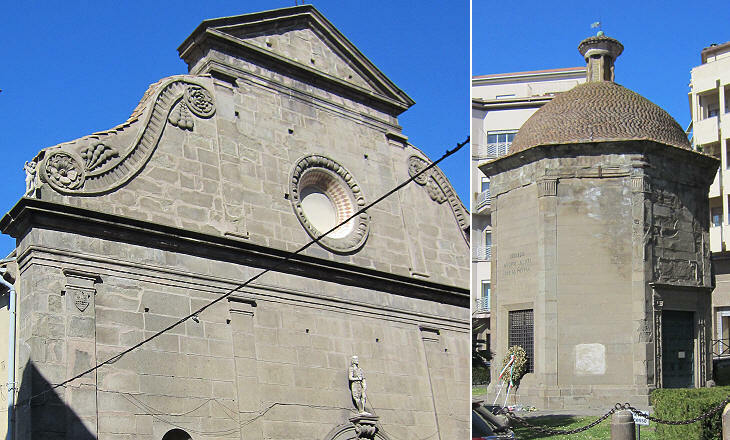 The 1944 bombs destroyed most of S. Maria delle Fortezze, a Renaissance church built in 1514-21 and which also stood near the railway station; what is left resembles a portico, but it is actually the rear part of the building. Florentine Cardinal Giovanni de' Medici (Pope Leo X) promoted the construction of Collegiata di S. Cristina at Bolsena, a very elegant Renaissance building; Giovanni Battista Almadiani from Viterbo, one of his advisors, financed the construction of a church dedicated to St. John the Baptist, the patron saint of Florence; the design of the building is attributed to a local architect who surely had seen S. Agostino in Rome. 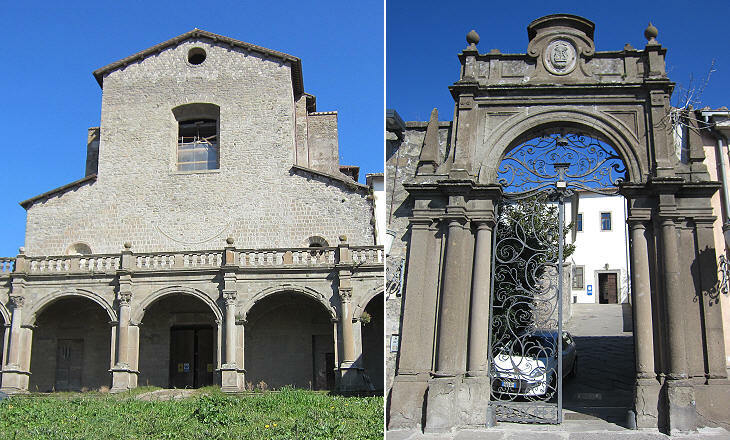 A Renaissance chapel is located near S. Giovanni Battista; it is an ex-voto built for the end of a pestilence in 1501; it is now dedicated to the Fallen of WWI. 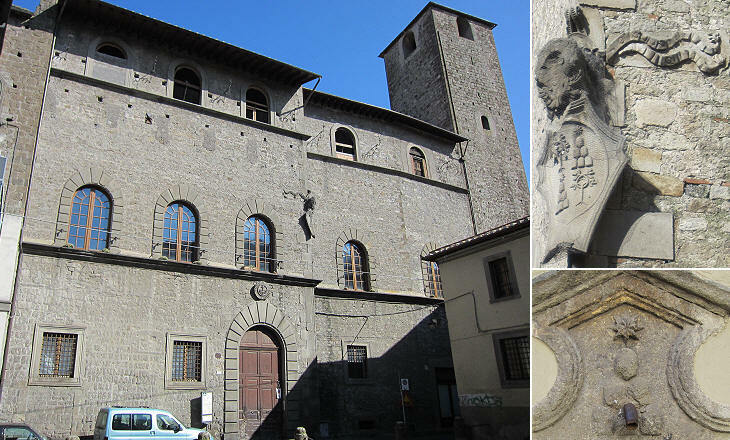 The Farnese, the family of Pope Paul III came from Canino, a small town between Viterbo and the sea; the palace named after them is actually a medieval building which they acquired in 1431 and where they lived for a century. 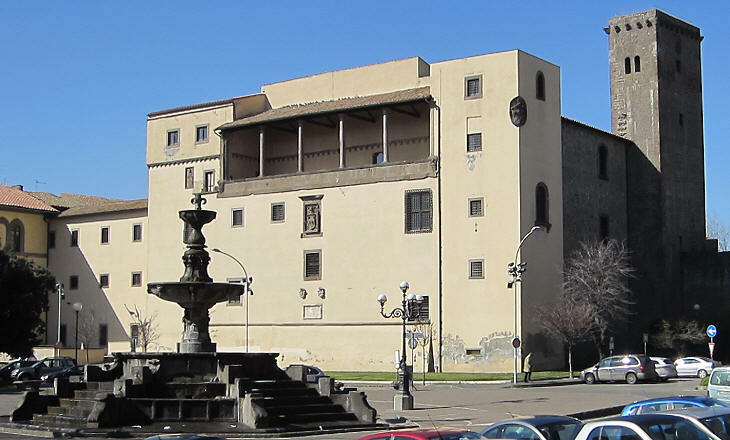 In 1354 Cardinal Gil de Albornoz built a small fortress at the northern end of the town; it was not meant to protect Viterbo from external threats, but to strengthen papal authority over its inhabitants. 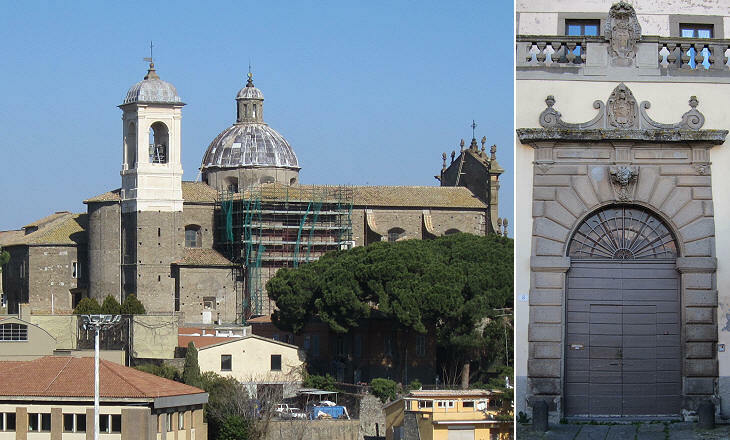 The original fortress was modified by several popes and eventually by Pope Paul III who added a loggia at the top of the building; he had done the same at Castel Sant'Angelo. 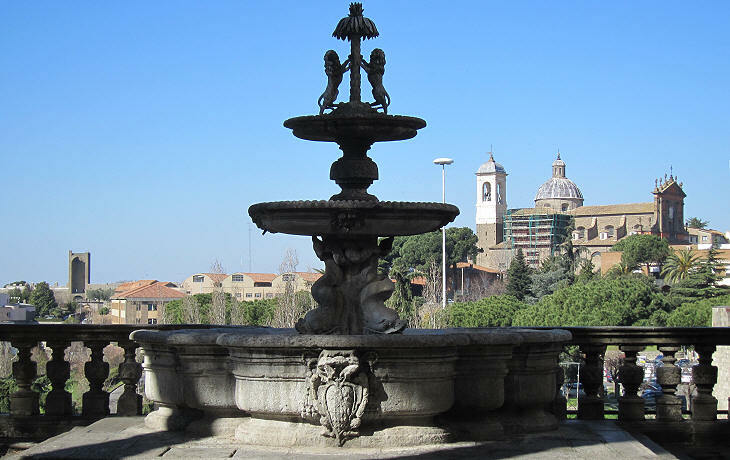 The fountain was designed by il Vignola for Cardinal Alessandro Farnese, grandson of the pope. 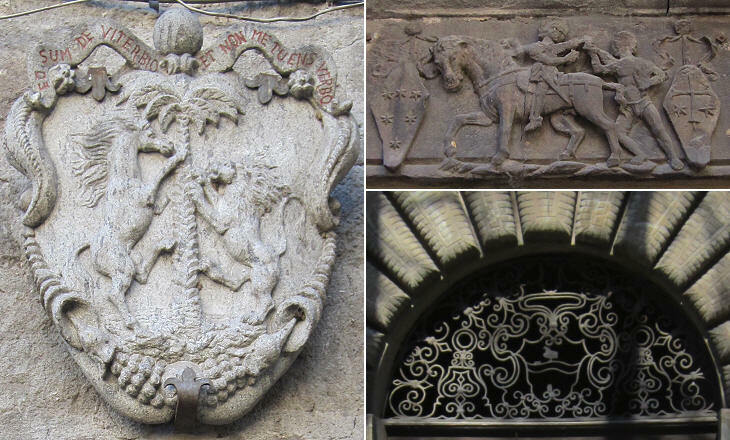 Another building of Viterbo is associated with Pope Paul III: the house of his barber Giovanni Antonio Baciocchi; inscriptions on the windows make reference to his trade, but one must bear in mind that barbers at that time performed several duties including pulling teeth and probably this explains how Baciocchi made enough money to build his house, which is located very near that of the Mazzatosta, one of the wealthiest families of Viterbo. 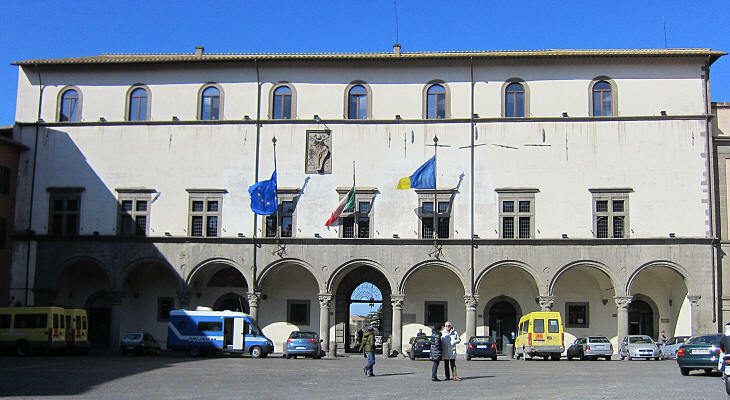 Palazzo Chigi was built in the XVth century and it was acquired by the Chigi in 1510 in connection with the assignment given to them of excavating the alum mines at Tolfa to them; the building had large warehouses where the product was stocked before being exported to Siena and Florence. S. Pietro is a medieval church which was redesigned at the beginning of the XVIth century at the request of Cardinal Raffaele Riario (who built Palazzo della Cancelleria in Rome); the steps were added in 1621-22. 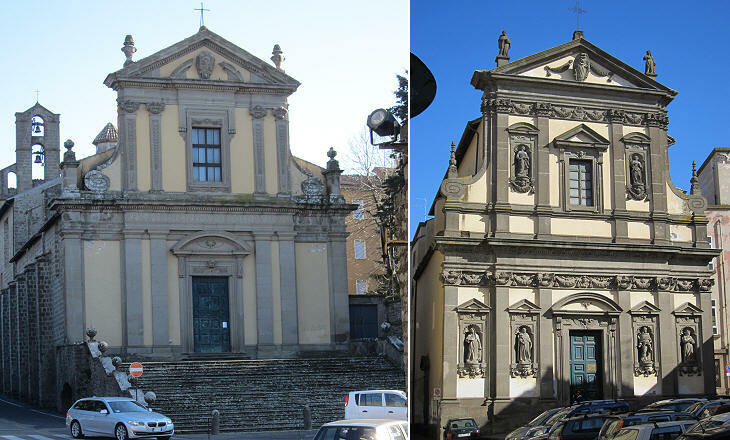 The façade of S. Maria della Pace resembles that of S. Pietro, but its rich decoration indicates that it was built in the second half of the XVIIth century. 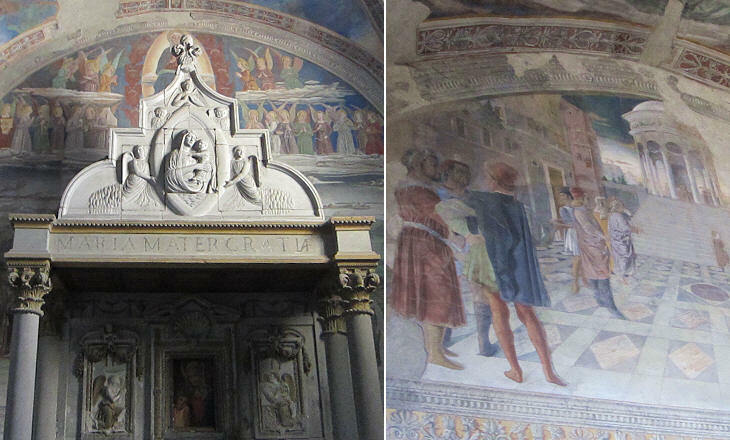 S. Maria del Suffragio was built in 1618 on the site of a medieval church by a brotherhood having the aim to celebrate masses for the souls in Purgatory; these intercessory prayers (suffrages) explain the name of the church; the brotherhood had many rich members and it could financially support the construction of a very elaborate façade. S. Maria della Visitazione is part of a Cistercian nunnery founded in 1557 by Gerolama Orsini, widow of Pier Luigi Farnese, son of Pope Paul III; the church was built in 1607-14, many years after her death, but as a tribute to her it was decorated with the Orsini heraldic symbols in addition to the Farnese ones. 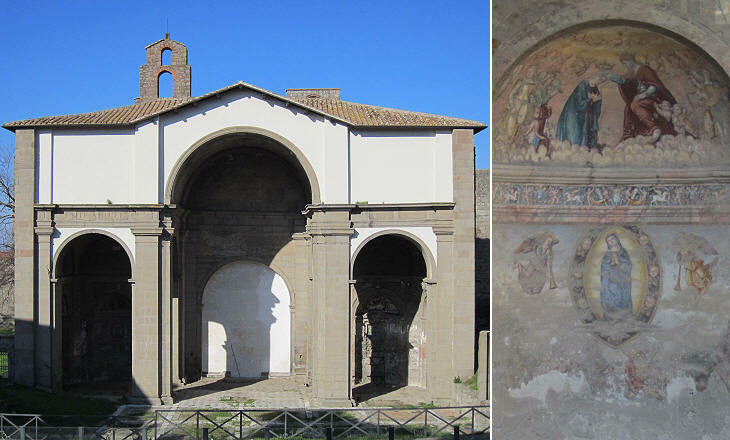 By the end of the XIIIth century the three hills inside the walls of Viterbo were crowned by a large church: the Cathedral on the southern hill, S. Francesco on the north-eastern one and SS. Trinità on the north-western one; the medieval church however was replaced by another building in 1727-45; it was designed by Giovan Battista Gazzale, who worked in other locations with Giovan Battista Contini, an important Roman architect. 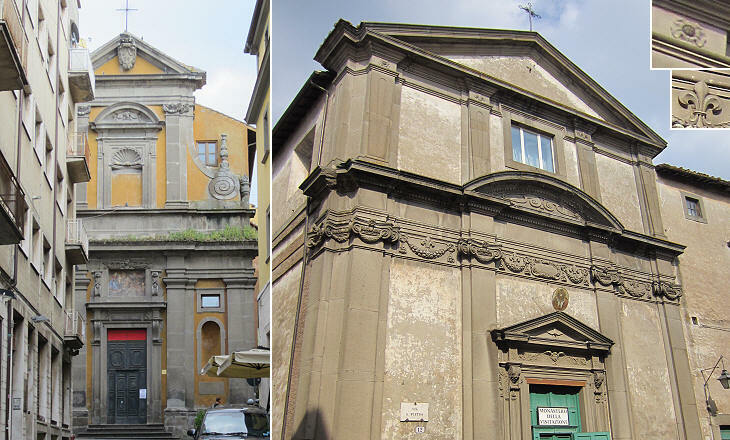 S. Maria in Gradi is a medieval church which was largely redesigned in 1737-58 by Nicola Salvi, the architect of Fontana di Trevi. Unfortunately, because of its proximity to the railway station, the church was almost destroyed by bombings in May 1944. 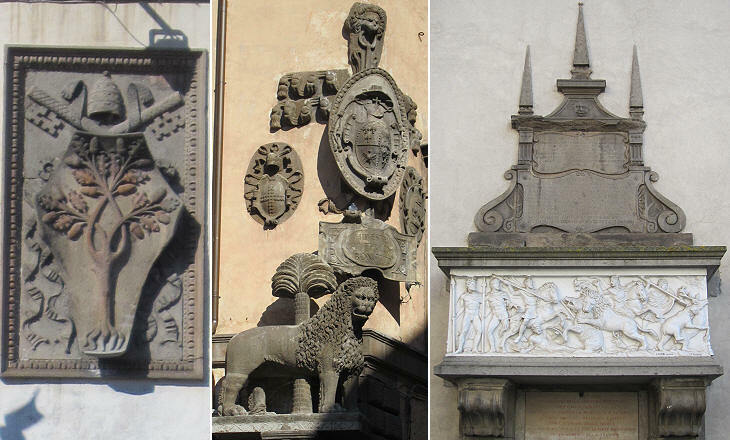 Viterbo is known for its many medieval fountains (see page three), but a few fountains were added in the following centuries; Fontana dei Leoni was built by Pope Alexander VI, but it was entirely redesigned in 1621-25; the lions of the old fountain were replaced by modern statues in 1877. 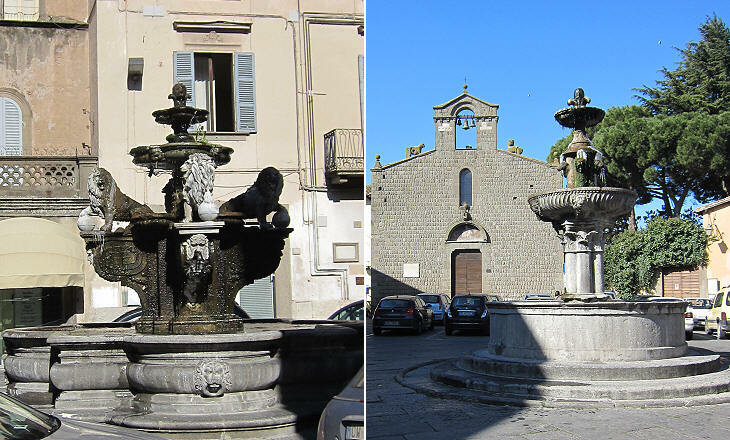 The fountain in Piazza del Gesù was built in the XVth century, but its current appearance is the result of assembling elements of different fountains; the basin above the capital is similar to that of the fountain in the Papal Palace.